Light is entering the scene from the sun above. Notice it lights the deer & lion particularly with an orange glow on the left. 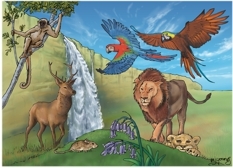 From left to right: Northern muriqui (woolly spider monkey), Red Deer, House Mouse, Green-winged macaw, Blue-and-yellow macaw, Lion. 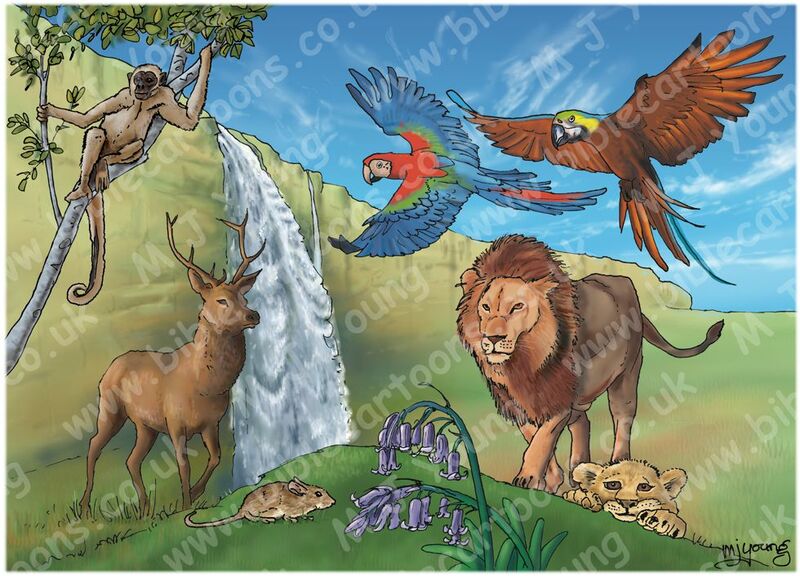 This scene has just been finished (Nov 2015) as 1 of 4 pictures for a local school. I was commissioned to produce 4 canvases that show the school values: Excellence, Respect, Inclusion & Aspiration. This scene depicts Excellence in the form of God’s creation in Genesis chapter 1. Northern muriqui (woolly spider monkey) (Brachyteles hypoxanthus) an endangered muriqui species endemic to Brazil. Red deer (Cervus elaphus) is one of the largest deer species. The house mouse (Mus musculus) characteristically having a pointed snout, small rounded ears, and a long naked or almost hairless tail. The green-winged macaw (Ara chloropterus), also known as the red-and-green macaw. This is the largest of the Ara genus, widespread in the forests and woodlands of northern and central South America. The blue-and-yellow macaw (Ara ararauna), also known as the blue-and-gold macaw, is a large South American parrot with blue top parts and yellow under parts. It inhabits forest & woodland of tropical South America. African lion (Panthera leo) & cub.